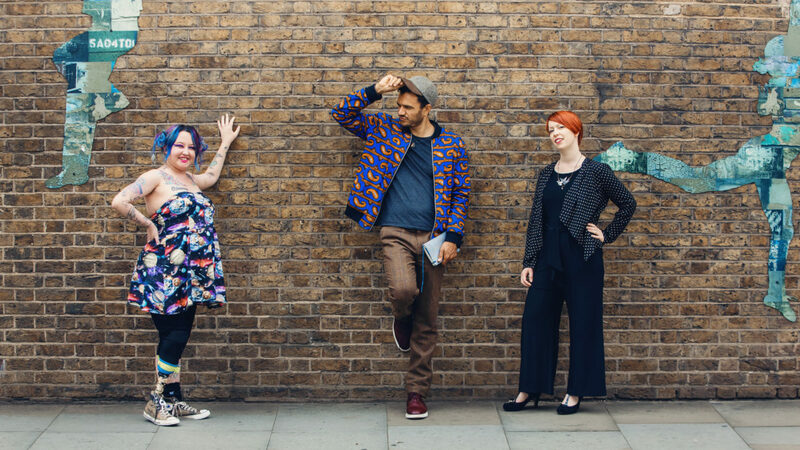 This month our first three Jerwood Compton Poetry Fellows Raymond Antrobus, Jackie Hagan and Jane Commane come to the end of their year-long Fellowships, which have been included a bursary of £15,000 and access to specialist mentoring and a pool of critical friends. The Jerwood Compton Poetry Fellowships set out to offer a significant new development opportunity for poets and support individuals whose practice encompasses poetry in the broadest artistic sense. They seek to contribute to a wider conversation about what poetry can be. During the Fellowships there are no expectations of published or performed outcomes from us, simply time for each poet to focus on their practice with specialist support. Nonetheless each has had a very full and exciting year. Raymond’s poem I Move Through London Like a Hotep was in the May issue of POETRY magazine, published by the Poetry Foundation in Chicago. To Sweeten Bitter was launched in Jamaica, the Virgin Islands and at the BOCAS Literature Festival 2018 in Trinidad. His first poetry collection The Perseverance was The Irish Times top read for 2018 and selected by the Poetry Book Society as its Winter Choice 2018. Raymond also secured a publisher and an agent and was one of a handful of Black British poets selected for the prestigious Cave Canem programme in the US. He was commissioned by Walker Books to produce a children’s book in 2019, completed his level two BSL training, and won the Geoffrey Dearmer Prize 2017 for his poem Sound Machine. Jane launched her first poetry collection, Assembly Lines at the Verve Festival 2018 in Birmingham. How to be a Poet: A 21st Century Guide to Writing Well, co-edited by Jo Bell, was ranked among the top five writing guides on Amazon and Jane continued to work on her second poetry collection. Jane also offered her services via Skype sessions for poetry reading groups, drafted a manifesto for writers, particularly those from working-class backgrounds, which was announced at the Ledbury Festival 2018 as part of her talk on Poetry and Class Politics in the Age of Austerity with Chloe Garner. Jackie was selected by Hat Trick Productions for its Your Voice, Your Story development scheme in partnership with Channel 4 and was commissioned by Contact Theatre Manchester and Hope Mill Theatre to write a children’s show,The Random Disco Bears for production in December 2018. She was also shortlisted for an Unlimited grant and a Wellcome Trust grant for We Want to Make You Happy, a collaboration with J. Fergus Evans that is an immersive installation. Jackie was nominated for an Inspiring Change award at the WOW Festival 2018 for people progressing equality in the arts; her one woman show, This is Not a Safe Place, showcased at the Hebden Bridge Festival in June 2018 and at the Unlimited Festival, Southbank Centre and it won a Saboteur Award 2018 for Best Spoken Word Show. Jackie is currently completing a poetry collection, and working on a show for the Sick Festival 2019 as one of its Catalyst Commission Artists. We also ran two public events in London and Leeds: Are Poets the New Creative Entrepreneurs? and Making The Connection, The Reality of Funding, Networking and Sustainability for Northern Poets. The first edition of the Fellowships was delivered by Joy Francis. She leaves us to concentrate on her work with Words Of Colour and the second edition of Jerwood Compton Poetry Fellowships will be run by Nathalie Teitler. Three new Jerwood Compton Poetry Fellows will be announced early next year, selected through a closed nominations process. The Fellowships run across three editions from 2017- 2022. The Jerwood Compton Fellowships are designed and managed by Jerwood Arts, with support from Arts Council England including funds from the Joseph Compton bequest.